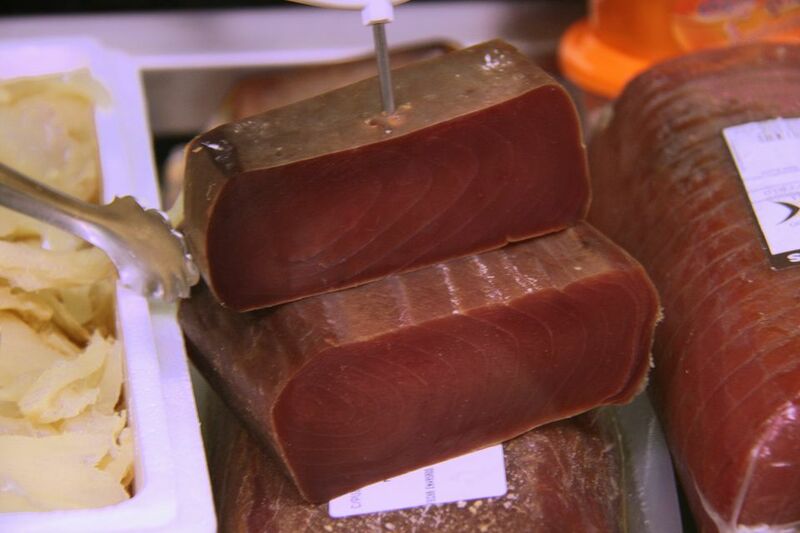 Mojama, or dried tuna, is popular in Spanish cuisine. It adds a salty flavor to meals and is growing in popularity across the globe. This food has origins that run pretty deep in Spanish culture. For centuries, fishermen in warm climates have turned to drying or curing fish to preserve their catch. The fishermen off the southwest coast of Spain would pack fish in sea salt, and then hang them in the sun to dry. Even though it is not necessary to preserve fish this way with today’s advances in refrigeration and onboard freezers, people still love to eat salted fish. The tradition of drying tuna in Spain goes back many centuries and it is known that the Arabs dried tuna during their reign, calling it mama. As the tuna dries, it shrinks and then the pale-red fish turns a dark reddish-brown. Mojama has a firm consistency. Mojama is considered a delicacy and is produced in the provinces of Huelva and Cadiz in the Atlantic, as well as Valencia, Murcia, and Almeria in the Mediterranean. Available in various markets throughout Spain, the mojama is available in chunks and sold by weight. If you do not live in Spain, you can purchase it in vacuum-packed packages at gourmet or ethnic food markets, or over the internet. There are a few different ways to eat mojama as a topping or a tape. It is available in firm, thick wedges that are easy to grate over other food or eat plain. If you want to give something a salty taste, just grate up some mojama for a little extra flavor. The tuna is ideal over whole-grain toast when topped with salad or a fried egg, on top of beans or on top of pasta. Mojama can also be put over scrambled eggs or whole Marcona almonds that are toasted in olive oil. Mojama makes a superb and simple tapa served with sliced bread and toasted almonds or green olives. The mojama is usually sliced thin with olive oil and chopped tomatoes or almonds. In Madrid, it is often served in the afternoon with beer and olives. Mojama has gained a lot of popularity in recent years. It has gotten new life in trendy restaurants throughout the United States, where it is making its way onto more menus. If you make it at home or put it into dishes at home, the key is to keep it simple. Don't add mojama to anything where you already have complex flavors. In other words, let the mojama be the primary flavor of the meal. Which is the Best Spanish Cookbook?